Calcite is nothing but natural calcium carbonate (CaCO3). And Calcite grains means granulation of the naturally occuring calcite lumps using dis-integrator and sieving machines. We are a manufacturer and supplier of a qualitative gamut of Calcite Grains and Calcite Powder in Udaipur and Makrana in Rajasthan state of India. We provide finest Calcite Grains found in India which includes upto 96 % of CACO3 which is mainly used in PVC Pipes, Paints,Glass Industry, etc. Our offered products are available as per the industry standards and needs of customers. Moreover, we provide products to the customers at industry leading prices. Different sizes of Calcite Powder available at our factory is 200#, 240#, 300#, 350#, 400#, 500#, Up to 5 Microns. and Different sizes of Calcite Grains available at our factory is 16/32#, 24/60#, 30/80#, 50/150#, 100# Fine, 1-2mm, 2mm. We can supply you any size in this material with any mesh. Please fill the contact us form and let us know the size you require . Cement Bricks – Used as a main component. Engineering Stone / Counter tops / Quartz Stone – Used as Filler. Steel – Used as purifying agent. 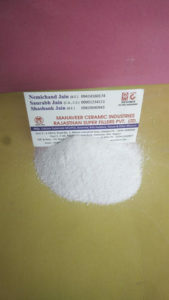 Rubber – Substitute of Calcite and Filler. Wall Texture – Grains are used as texture. Glass Industry – Used as a purifying agent. Check our indiamart profile also.